Here you will find our ceramic ring collection. Use the menus below to see rings of a specific size. Need help in figuring out your ring size? 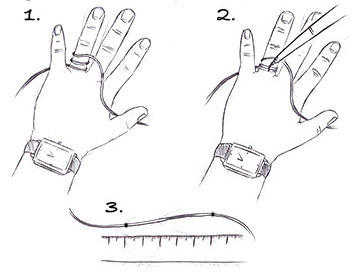 Juts see our handy guide: "How do I find my ring size?" that you will find on every ring's product page. Men's rings made out of ceramics are lightweight and incredibly comfortable to wear. Similarly to tungsten, ceramic is a very strong material and cannot easily be scratched. And if by mischance you do get a scratch, it will not be very apparent because ceramic rings have the same colour through and through. All ceramic rings from Trendhim are highly polished and keep their shine for years. Ceramics are not metallic material like steel, titanium and tungsten. Ceramics are usually black or white but can be made in beautiful colours. Ceramics do not conduct electricity very well. Ceramic rings weight much less than metal rings. All ring sizes are shown as 62 / 10 / T Â¹/â, where 62 is the inner circumference in mm, 10 the US ring size and T Â¹/â the UK ring size. Are you unaware of your actual ring size? Just look at the easy sizing method below. 1. Snugly tie a thin piece of string around your finger. 2. Draw a straight line through the strings. 3. The distance between the two lines is your finger's circumference in mm which is the proper ring size to use when ordering.